Arsenal "Fan Site" - Four current stars better than Cesc Fabregas! It must have been hard for Arsenal fans to sit and watch Cesc Fabregas back in the Premier League on Monday Night and especially playing for Chelsea. For one site in particular, they have made comparisons to what Arsenal have now without him. "She Wore A Yellow Ribbon" - the Arsenal Fan site has written an article today claiming that they have four of their current stars that are better than Fabregas! The four players the site refers to are: Mesut Ozil, Alexis Sanchez, Theo Walcott and Aaron Ramsey. Now first and foremost, we are only talking about one performance in the Premier League so far. Granted Chelsea fans have watched Cesc in Pre Season and have seen just what he can do, but we have to judge based on the Premier League. Two of those Arsenal players are wingers so you cannot compare (Sanchez and Walcott), Ozil had not played the same position that Fabregas occupies currently last season so that leaves Aaron Ramsey. I don't really think that you can compare the two really as I see them as different players. Ramsey is more of your box-to-box midfielder and as we have seen in the last twelve months, a goalscorer. Ramsey is all about getting involved in possession but in the hope that he can get into the box to get on the end of a pass or a cross. He relies on someone else providing to him in that area and he has shown more than enough to prove that he will do that on a consistent basis if he stays fit. I personally see Cesc Fabregas as a different player. As I have stated on here before, it never felt as though he fitted in at Barcelona, that if anything, they tried to make it work but it never really seemed fluid enough. If you push Fabregas forward and ask him to continue to make those runs into the final third, you take away his vision and creativity. You only have to look at him stepping up from midfield the other night from deep to play the pass he did to Andre Schurrle to see just how effective he can be. 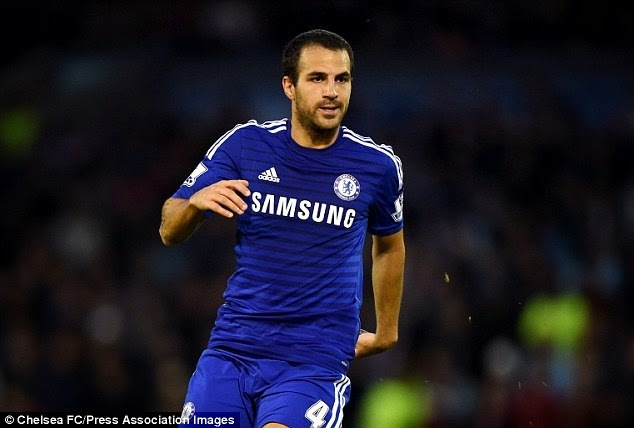 Fabregas' game is about seeing everything in front of him, seeing the game as a picture as it unfolds. He had 104 touches of the ball at Burnley, two assists and conducted the Mourinho Orchestra from that position. Some of you will have a different opinion on this but I do not see Aaron Ramsey as the same. The thing is, there was always going to be a comparison between what Arsenal have now compared to what Chelsea have as soon as he signed. You make the best of what you have in my opinion and I am so pleased to say we have Fabregas!